Jewish farmer from Samaria wounded by Arab assailants, is taken into custody for drawing gun to fend off attackers. A resident of a Jewish community in Samaria was attacked by stone-throwers on Sunday, and subsequently detained for questioning by police. The assault occurred when the victim of the attack, a farmer from the town of Shilo, approached a suspicious car which had driven up to the town’s edge. 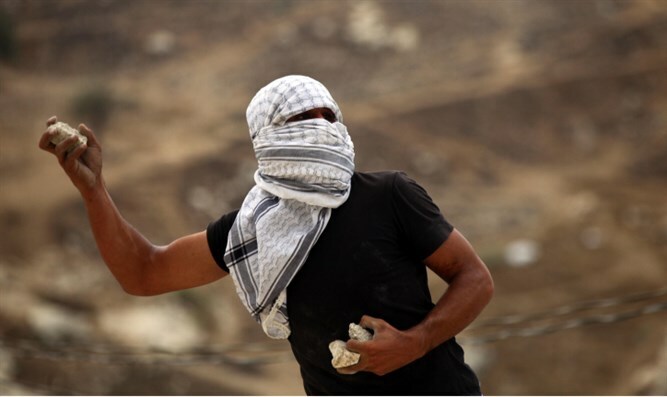 The farmer, seeking to ascertain the intentions of the four Arabs inside the car, suddenly found himself under attack, as the occupants of the car exited the vehicle and began hurling stones at him and beating him with sticks. After he was injured in the unprovoked attack, the resident of Shilo drew his personal sidearm and successfully warded off his assailants, who fled the scene. When security forces arrived, they located the attackers and took the four into custody, but also detained the victim of the attack. Police questioned the man over his drawing of the weapon, even though he was clearly endangered by the four attackers and had not even fired his weapon. Nati Rom, an attorney for the Honenu organization, which provides legal aid to Jewish police detainees, slammed the police response to the incident.